Thorazine back together – Philly show May 3! Way back in the 90s, Dionysus Records had a marvelous Philly punk group on its’ Hell Yeah label called Thorazine. We did two LPs and two 7″ with them, and even with the miles between Thorazine and the label – due to their constant touring and a couple of visits to Philly by Dionysus staff, the group, myself and everyone else at label got to spend quite a bit of time together. Those were memorable times for all of us! Thorazine were more than a band, they were a family. 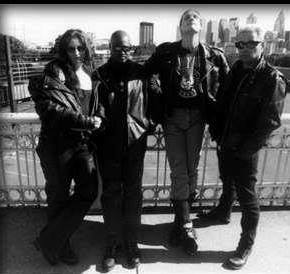 In the 90’s they lived together in a big old house in West Philly rehearsing and writing songs in the basement. Then they toured as much as possible. As families do at times, the band parted ways and moved on with life although all the band members have remained in Philadelphia. 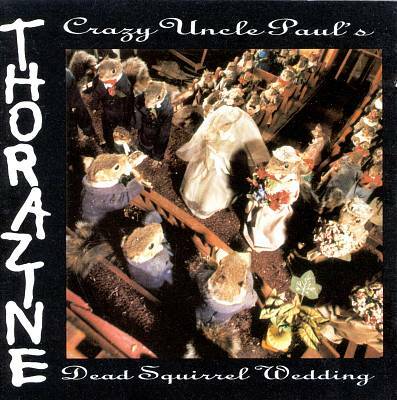 In 2013 Heather Gillespie decided to make a documentary about the Dead Squirrel Wedding featured on Thorazine’s first album on Hell Yeah Records titled, Crazy Uncle Paul’s Dead Squirrel Wedding. Her project reunited the band for the first time in a decade. After their reunion was filmed as part of the documentary, the band was surprised to find that they were still finishing each others sentences after so much time apart. Slowly they were all in contact with each other regularly and they decided to get together to see if it would still be fun to play together. It was magical like back in the day and quickly they had a show booked. The show on May 3rd in Philadelphia is about to sell out six weeks before the show. The band is beyond excited to be back together rehearsing weekly. They are so humbled that so many people are enthusiastic to see them hit the stage again. Who knows what adventures this reunion will bring the band next. Only time will tell, stay tuned. We still have a limited amount of Thorazine records and CDs here plus their two LPs and 7″ are available via iTunes, eMusic, Amazon, etc.